Welcome back! 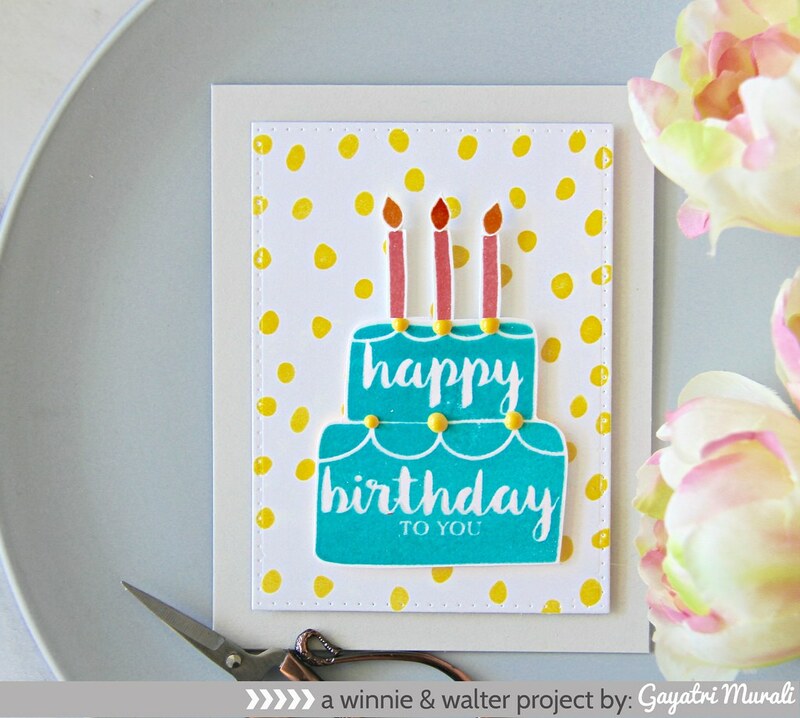 Today is day #2 of Winnie & Walter June Release. I am showcasing a new stamp set which is free with qualifying $25 purchase. 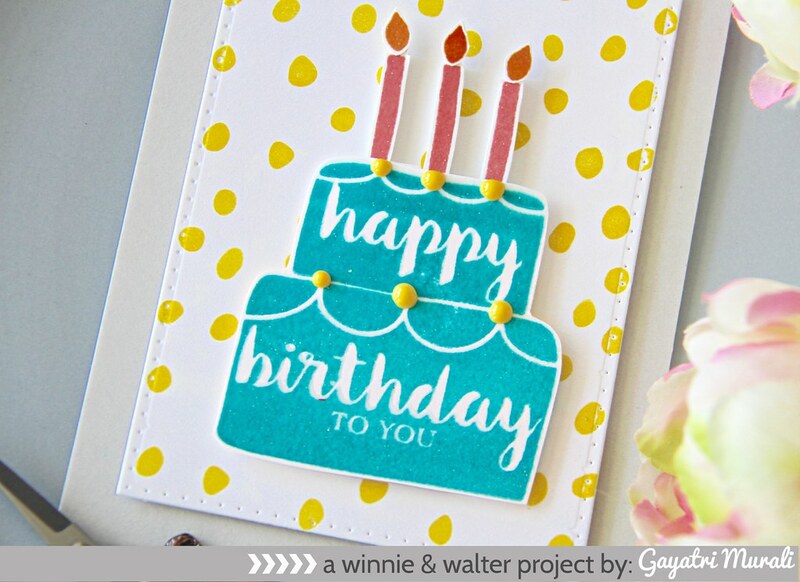 This stamp set is called Happy Birthday to You. I have combined this stamp set with another new stamp set called Mini Scenery: Spotty. I die cut a white cardstock using Audrey Cutaway smaller rectangle die. I stamped the Mini Scenery : Spotty using yellow pigment ink. Then I blue heat embossed the birthday cake image on another scrap piece of white cardstock. I hand cut the image out. I similarly pink heat embossed the candles and the flames as well. I hand cut them all out. The cake, candles and flames are adhered on the spotty panel using foam adhesive. The panel is adhered on the grey card base using foam adhesives as well. I then added a few yellow Nuvo Crystal drops on the cake to tie in the yellow spots on the background. A simple card. No sentiment needed as the cake has its own sentiment. The Big Giveaway is where we randomly pick one (1) lucky winner to receive the stamps from our June 2017 Release and they are pretty darn awesome! That’s all seven (7) stamp sets (which includes the free with purchase set) and the creative screenings!! You don’t have just one chance to win, but a lucky 7! You can do as many or as few entries as you want. Remember that if you take advantage of all 7 chances to win, you will have commented on this blog post 7 times. Each chance = a separate comment. Like us on Facebook. Leave a comment that you like us on Facebook…we like you right back! (If you already like us on Facebook, let us know! And thank you.) As a little bonus for liking us on Facebook we have some fan freebies…just check under the “like our page” tab. Feel free to join our June 2017 Release event! 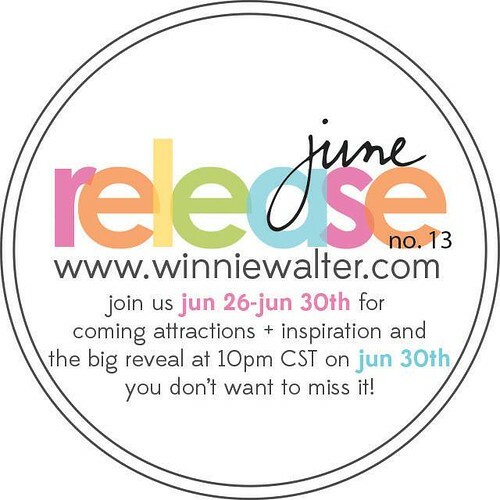 Share about Winnie & Walter’s June 2017 Release on Twitter, Facebook, your blog or Instagram. (#winniewalter) Leave a comment that you shared and thank you! You have until 11:59 p.m. (central standard time) on June 30, 2017 to enter. Thanks so much for stopping by. See you tomorrow for more release project. These cards have been great. Thanks for the inspiration. I follow on Facebook and Pintrest. Thanks Sharon. Please follow Winnie&Walter on Facebook and Pinterest for a chance to win.